David and I got to have some quiet hours together, just the two of us, yesterday on Christmas, and we spent some of it in each others arms talking about our 35 years of marriage (our anniversary is today), thinking about how much we've learned from one another and changed because of each other's influence. We wondered what the percentage would be of American couples of our generation who, at 35 years of marriage, still love AND LIKE each other (though I might have to resort to violence if we spent all our waking hours together :-). I told David I would marry him all over again, even knowing now all the challenges and conflict we would struggle through and David told me, as he has before, that if he had it to do over he would have married me several years sooner - precluding some of our challenges and no doubt substituting others. We emphatically agreed that we were NOT willing to start all over with someone else. So anyway, I thought I might attempt to use posts on this and The View From Here over the next several weeks to give thanks for my husband, reflect on marriage, and share several poems by others. 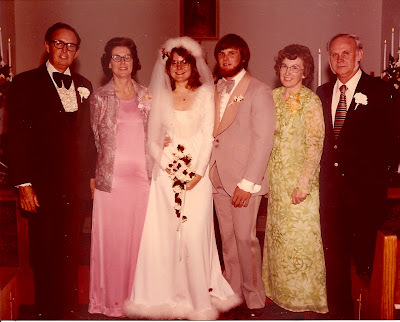 Two years before David and I married, before we were even dating, I read a poem for my Oral Interpretation class written by Archibald McLeish, in which he reflected on a photograph of himself and his wife early in marriage and on their many years of sharing life together. I remember telling the class that the poem demonstrated his positive view of life-long marriage and mutual commitments to choose to love. I told them that I liked the poem because it reminded me of the marriage my parents modeled for me, even though they had not traveled the world like the McLeish's. I told them I hoped one day, to look back on my own marriage with the same positive view point. Holding heapedup morning toward you? Widening circles out of time? I saw them too. I know those places. Or a town or a room, but I have seen it. Wherever you are we two were happy. Whose past is parting: strangers side by side. I'm very grateful that both David and I had parents who modeled commitment, kindness, fidelity and truly caring for one another in marriage. And I'm so thankful that David and I have both determined over and over again to also choose those life disciplines and to forgive each other as often as we have hurt each other in our 35 years together. Very poignant Sandy. I really like what you said about forgiving one another as often as you've hurt one another. 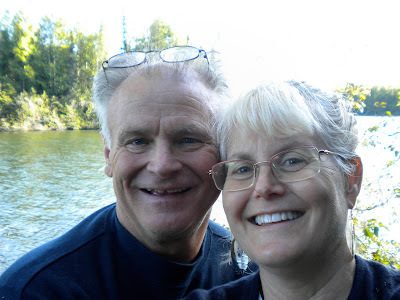 I look forward to 35 years with my husband - thanks so much for sharing. I am just reading several of your posts and I look forward to reading the ones to come. I need to pass these along, as I know many of us can benefit from your wisdom and experience. I've been looking for this poem for YEARS on the internet and am so excited to have found, at least, a part of it. Do you know the title and where I might be able to get the full text? What do you remember thinking back?